A Freedom Dinner in TEXAS! Yes, it’s true, we are thrilled to be partnering with Old Quail Run Farm in Sherman, Texas area to start Freedom Dinners in their community. If you want to get more information or purchase tickets head to their site for all the details. Click Here Reserve Your Spot! Treat yourself to a day in the Willow & Mabel Garden Co greenhouse learning tips and tricks on how to create your own Pedestal Vase Flower Arrangement. Join us for an unforgettable evening gathered at the table in Willow & Mabel Garden Co. Greenhouse. As we’re surrounded by the magical space and beautiful table we’ll be talking about the fears that crop up for all of us as we take the brave steps toward the things we’re thinking and dreaming about. Join us for the most incredible community pot luck ever! We’re gathering everyone from bakers to farmers, florists to artists to create a beautiful evening gathering together in the name of Freedom. Proceeds from this community pot luck are benefiting Rescue:Freedom Int to aide in the fight against Human Trafficking. **Tickets will be $75 and available for purchase May 27th. Join us on Willow & Mabel's Flower Farm for a workshop on how to cut, care and arrange fresh flowers. Hello Holidays and Decking the Halls with handmade Wreaths! Join us for a festive time on the Flower Farm sipping mulled beverages and creating your own wreath masterpiece. What does it look like to create rhythms in our lives that allow for space to create, space for rest, space to enjoy? Join me at my table for a time to reflect, connect and grow with other women from around our community. Come shop all the fair trade products you’ve seen online in person. From handmade leather bags straight from Guatemala to our hand carved serving dishes and spoons, you’ll find something for you and a friend. Be sure to stop by our shop, say hi, and make a purchase that day that will give back in more ways than one with 10% proceeds going to fighting human trafficking with Rescue:Freedom Int. SOLD OUT :: Sorry we missed you this time! Reserve your seat NOW for the next gathering March 23! Join me at my table for an evening of intentional conversation. Let's gather face to face with other women from all across our communities to talk about what is stopping us in our pursuit of dreams, what is taking up our time and how we can go from thinking about what we’d like to do to living it out each day. I have thought through every detail of this evening, from the lights to the decor, to the words I want to speak over you and what items will greet you at your spot. This will be an evening of unrushed time to savor simply being together. Oh my am I excited to bring it all to life for us and to enjoy an evening gathered at the table together. I cannot wait to surround you with beauty and intention as you gather with me at my table. *Exact location and directions will be sent after your ticket purchase is complete. Each of the Dream Catcher Gatherings will have a different focus with this first one being on the struggle we all have of turning our intentions into action. The challenge of moving our hopes and dreams from ideas into our every day life. I have walked this road continually over the last few years and have found so many practical ways to grab hold of my own dreams. I can’t wait to share these tools with you! The evening will begin at 7 pm with sweet bites and refreshments, you’ll have a chance to mingle for a bit and then you'll be invited to the table for us to get started. I will spend the next 20 minutes sharing on the topic with open conversation for questions and further ideas and then we’ll move into a time to reflect and journal. After the reflection time we’ll be ready to start sharing with each other. Talking through what is stopping us from taking action and encouraging each other with fresh perspectives. The final reflection we will do before we wrap up the evening is planning out the next week, what it will look like for each of us and sharing with each other what time we have carved out to act on our intentions. * These evenings are open to any woman BUT Dream Catcher Community Members get a special discount PLUS the first chance at purchasing tickets. If you are not a Dream Catcher Community Member yet, come join us HERE! We are diving into content just like this every month and can’t wait to hear about what is on your heart. Come shop all the fair trade products you’ve seen online in person. 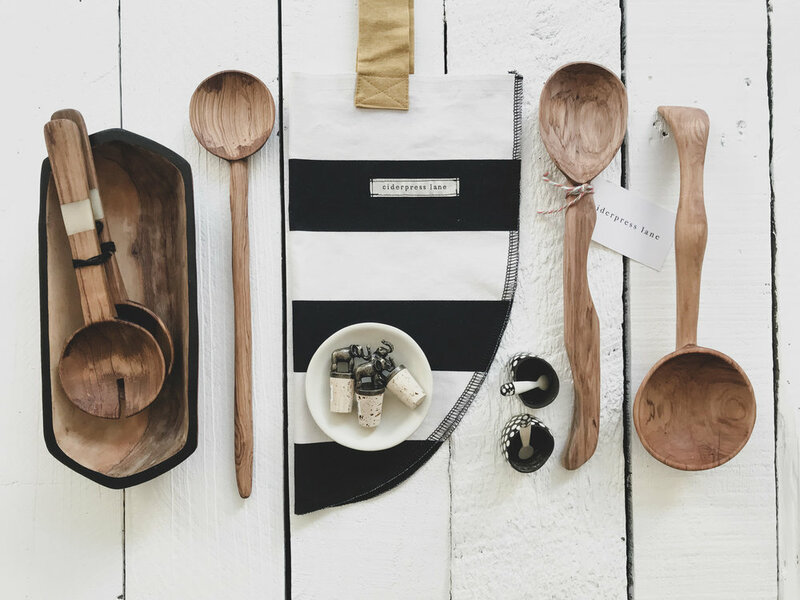 From our popular black and white striped totes to our beautifully carved serving spoons and bowls to our long awaited leather bags you’ll want to snag everything! Be sure to stop by our shop, say hi, and make a purchase that day that will give back in more ways than one. 10% of every sale goes to fighting human trafficking with Rescue:Freedom Int. All materials will be provided for you to create a fresh moss and evergreen cutting wreath. Plus the option of adding in holly leaves and berries, pine cones, ribbons, ornaments and more. While you're sipping holiday drinks and enjoying sweets you'll be creating a masterpiece. Invite your friends and let’s create together! Come see Kelly in downtown Poulsbo at the Sugar Flower Market. 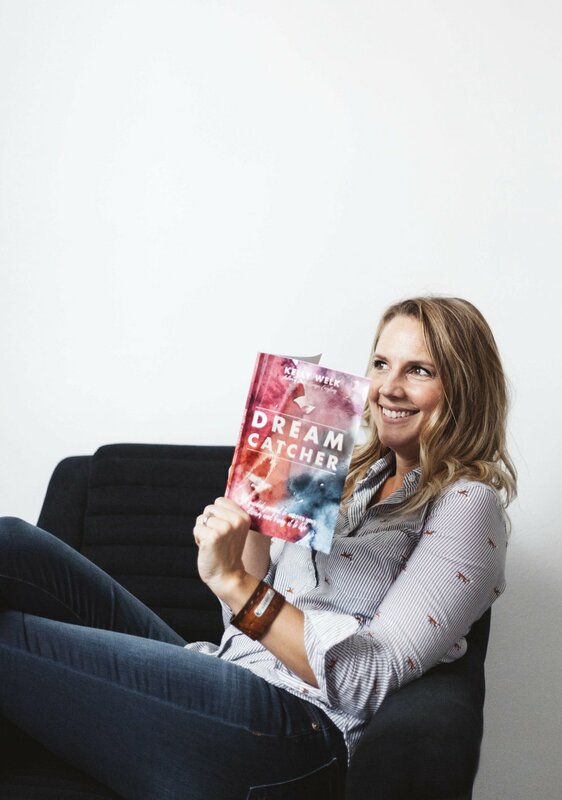 She’ll have her new book Dream Catcher with her ready for you to purchase and have signed if you’d like. Come say “Hi!” and tell her all about what you’ve been dreaming! Join us at the market and shop all our fair trade kitchen items in person! We are thrilled to be partnering with Twig and Vine Farm in the Bellingham area to start Freedom Dinners in their community. We are thrilled to be partnering with Prim & Rose in the Spokane area to start Freedom Dinners in their community. You will get special instruction from Carolyn Thompson, the founder of Willow & Mabel Garden Co. on how to cut the fresh flowers, tips on how to plant your own cutting garden and then she will walk you through every step of how to design your own bouquet. Join us at Willow & Mabel’s Flower Farm for a hands on floral workshop. Treat yourself to a spritzer and small bites as you take part in the instruction from Carolyn Thompson, the founder of Willow & Mabel Garden Co.
Join us at a pop up shop at Sugar Flower Market! Come shop all our fair trade kitchen products in person! Join us on an adventure in these mini photo sessions! Sip a summer beverage and stroll through the flower farm before clipping and arranging your own bouquet. This will be a meal that you'll always remember. Make this Mother's Day one to remember while you sip mimosas and create your own table centerpiece.